The four point attachment Cradle within the shell has a unique angular placement to provide optimum shock absorption..
Good site with best support and service team. Having problem in buying safety helmets from here, support team assist me brilliantly. The items I purchased from moglix store was great. 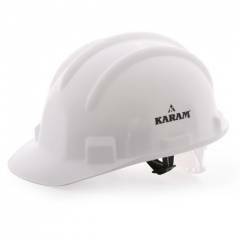 Karam white safety helmet is of very good plastic material, adjustable strap makes it more comfortable. Very happy with this product. Product quality is good, Working well and safety helmets from karam are of best quality material, I am very happy with prices and services.